All it would take is a line here saying for FULL Install do not save to file. Seems it would save some confusion as I'm sure I'm not the first. Usually the cd ejects at the finish of the full install. Maybe it was assumed that everyone would know not to save. yes, a note not to save at the end of the install would help. New to Puppy Linux so am going to ask some dumb questions. I have an old NEC laptop with 498MHz Celeron, 192Mb RAM, 5Gb HDD, floppy and CD drives. Has 2 USB sockets but BIOS will not allow boot from them. Laptop used to have Win98 but someone installed WinXP and it goes like a slug as can be imagined. Plan to wipe the HDD and install Puppy. 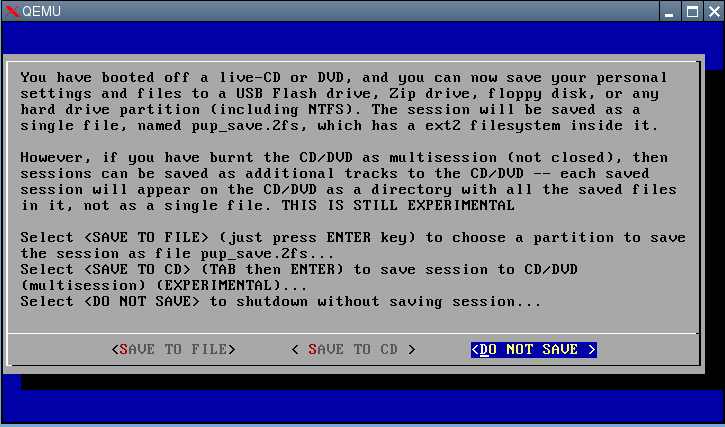 Have made a CD with Puppy on it and that boots up and runs OK. Downloaded installers.tar.gz file on to a floppy to do installation to HDD but this is a compressed or 'Zip" type file. How do I unpack this file? What do I use? How do I copy the unpacked installer file(s) back onto the floppy? How do I unpack this file? Just click on it. The package will open in Puppy's extraction program. Select all the files and save them to some convenient spot. How do I copy the unpacked installer file(s) back onto the floppy? Mount your diskette. Open a window onto the diskette and another window onto the location of the files. Drag them over just like you would do in Windows. Unmount the diskette before removing it. All went well with the install and I have a dedicated Puppy laptop. A bit hairy at the end of the install as I was not quite sure when to kill Grub. Will now have to learn not to double click everything! This installer is great. I had tried the Universal installer a few times but my Thinkpad 600x wouldn't boot from grub no matter where I put it. This worked first time. Maybe it was to do with the wiping of the disk. The quick installer seemed to alter some settings of the cylinders and it then worked. Posted: Thu 29 Jul 2010, 03:24 Post subject: Is this right? According to what you say here, and according to what I understand, I should redo my installation of Puppy from scratch from the CD, but this time, hit F2 and choose the option "Puppy pfix=ram". Then when I get to the xwin, I run the Puppy Universal Installer but quit when it talks about installing GRUB. Then reboot (without doing andy file save) and then i can reboot from my hard drive from then on. I expected the installation of "Lucid Puppy" to be something like my experience with Ubuntu and Debian. With those previous linux distributions after I ran the installation from a CD, I could remove the CD and reboot. This was not the case with Lucid Puppy. After I ran (what I thought was) the installation, it seemed that the whole Operating System was in RAM and when I rebooted I found that the previous installed OS on the hard drive came up. passed to any Linux kernal listed there. What should I do and how do I do it? At the bottm of the screen there are suggestions how to edit files. Unix and Linux is new to me. I hope I can get some direction here with better experienced people. I would think that installing any software would cause that installation to be placed on the users hard drive. I would expect that that would be the defaut option and doing otherwise might be diffiicult or impossible. What I should do is do a new installation from scratch but this time use the option "puppy pfix=ram" and when I get to the point in the Puppy Universal Installer where the it is insatlling GRUB, I cancel it and everything will work. is that right? Hello! I am booting off the live CD right now, and when I click Download it downloads viewtopic.php, not one-click-installer.tar.gz. Can you help me with this? I'm not sure if this computer is capable of copying files from a flash drive, but if that's my only option I can try. What Puppy version and which browser are you using? Try right-clicking and doing a Save-As operation. Right click and Save As had the same results. I'm using 5.10 and the default Netsurf Small Web Browser. The most recent Puppy 5.1.x has replaced Netsurf with Midori. It can do a download properly. I tried SeaMonkey and it downloads correctly. Thank You! Over a year since I wrote this and thought I would try Puppy 5.2 on a Full install. I see nothing has changed and I am still struggling with a full install (as our other frustrated novices I have discussed Puppy with). (Shouldn't be this hard.) Puppy Lucid still no closer to the ease of Ubuntu Lucid installer despite the names. The request to make a pupsave file is not coming from the Universal Installer - it's from the shut down dialog. The latter is not aware that the former has been run. Read here to see the whole procedure. Those instructions also say to NOT make a pupsave file.